If you don’t follow British architecture closely, you may not know the name of the 2017 recipient of Britain’s most prestigious lifetime architectural achievement gong, the RIBA Royal Gold Medal. Yesterday, the Royal Institute of British Architects awarded the medal to Neave Brown, an 88-year-old American born, London-based architect whose work has focused on that least prestigious and most reviled of specialisms, public housing. Brown’s work is hardly unsung—he’s the first architect working in Britain to have every one of his buildings listed as a historic monument. But a specialist in public housing still makes an unusual choice for an award that in the past has gone to starchitects known for high-profile prestige projects such as Zaha Hadid and I.M. Pei. So why is Brown’s work so worthy of celebration, and why, after retiring some years ago, is he getting the medal now? The reasons reveal something about both the quality of Brown’s work and the mood in contemporary Britain. The architect’s best-known work went up during what is now recognized as a 1960s and ‘70s golden age for British public housing, when Brown was working as part of a talented team for the North London borough of Camden. What’s perhaps most striking about his buildings of this period is that they managed to break new ground—and set a high standard of quality—while simultaneously developing a recognizably British rowhouse tradition. Housing projects such as Brown’s masterpiece, the Alexandra Road estate, broke away from the Modernist tower template to create low-rise ziggurat-like terraces, an approach that nonetheless managed to fit large numbers of homes into a long, lean scrap of land alongside a railway line. This approach didn’t just harmonize the new buildings better with North London's largely Victorian fabric; it opened up possibilities for building better on narrow, complicated sites. The result is ingenious and delightful. 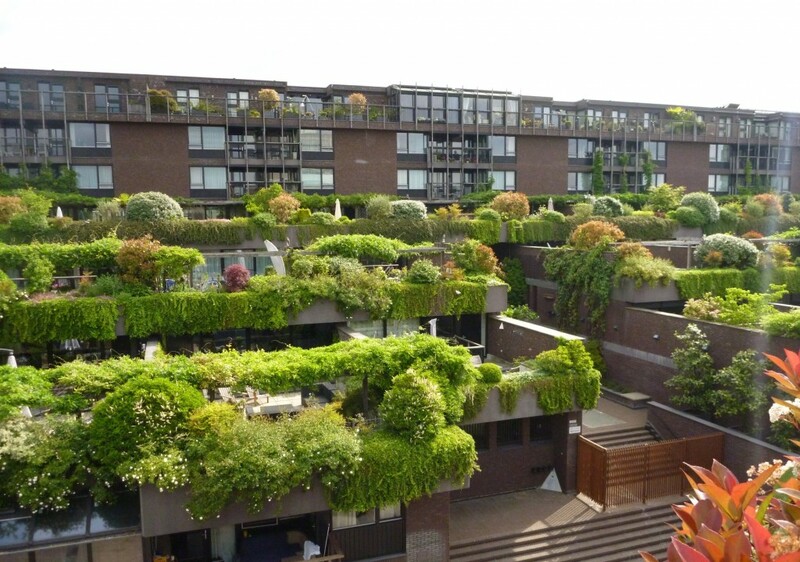 The inward-facing fronts of these apartments are stacked with balconies that riot with greenery in spring, creating a delicate, seamless-looking cascade of private, semi-private, and public space. Meanwhile, the building backs facing the railway are largely windowless to reduce noise, bulging out like the stands of a stadium. Inside, light streams into the duplexes, with open-plan kitchen-living rooms and bedrooms above. By the standards set here, even luxury contemporary housing built in London looks rather mean and uninspired. It’s no coincidence that when Margaret Thatcher’s government smashed Britain’s public housing system with a right-to-buy scheme that pushed many projects into private ownership, these homes were often snapped up at high prices by architects and design buffs. These flats designed primarily for people on low incomes have developed a strange second life as desirable Modernist eye candy, their interiors endlessly browsable on niche property sites such as this one. Despite his buildings’ latterly recognized success, Brown’s British work petered out in the late 1970s. One reason why is that such housing was expensive and sometimes complicated to build. It had its growing pains (heated walls at Alexandra Road initially made residents boil) and was often poorly maintained by the borough, leaving to a degraded public face. Mainly, however, it was a powerful swing against Modernism—even context-sensitive Modernism such as Brown’s—that ended his run of great London housing, a swing that came as much from the left as from the right. The Camden architects’ work was, like that of many others, damned as mechanistic and heartless. In the most extreme critiques it was attacked as an avant-garde experiment by an unaccountable elite of architects who themselves probably lived in cozy Georgian houses, which at that time city architects could still just about afford. This was bitterly unfair. Brown’s buildings showed careful thought both about their residents and their existing surroundings. Moreover, Neave Brown didn’t just like his own buildings: He lived in one. To this day, as this article reveals, his home is an apartment in a Camden project of his own design. Brown nonetheless built nothing in the U.K. after the 1970s, turning instead to the Netherlands, where subsequent beautiful developments reveal what Britain missed out on. Brown’s buildings showed careful thought both about their residents and their existing surroundings. Moreover, Neave Brown didn’t just like his own buildings: He lived in one. Brown’s long return to British acclaim has come over decades when the country has had ample time to rue its abandonment of widespread public housing construction. It’s a tradition that many in the country nonetheless hope to revive. At this week’s annual Labour Party conference, leader Jeremy Corbyn promised more investment in social housing and the introduction of rent control if he is elected. This makes Brown’s work not just desirable, but topical. With London land values astronomically higher than they were in the 1970s, austerity-hit boroughs would no doubt struggle to build anything as ambitious as Brown’s Alexandra Road. The architects’ work is still inspirational, though—and if you think it’s loved now just because of the current outbreak of Brutalism nerdery alone, you’re missing something. These were buildings that stated clearly that ordinary people’s living conditions were important, that their surroundings were worthy of expenditure and attention so they could lead happier, more comfortable lives. That in itself is worthy of celebration.